Before dawn I moved up to be with the forward observers for the 8th Cavalry Regiment, which stood ready to move in beside or through the 5th. The weather was clear, and in the dim morning light I could see gunpowder flashes from the mountain as Japanese guns on the dark sides of each sharp ridge took aim on the landing Marines. Marine close air support planes were up early though, and rockets were soon let loose against any gun that dared light itself up in the shadows. The Marines had slipped a few radio-equipped spotters onto the island overnight, ready to guide in our planes using pre-arranged terrain marks. The part of the bay I can see does not have any Navy ships in it. The wreck of the USS Hazard can still be seen at low tide, where she tried to beach on the south shore of Sakura-jima to save her crew . 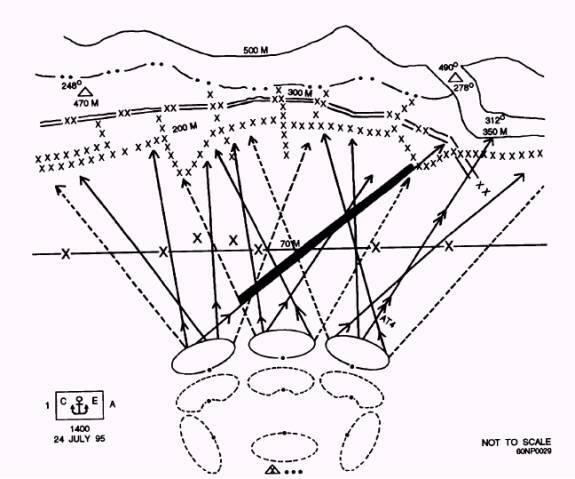 The sun rose over the few hills that push into the area occupied by 5th Cav, and Japanese spotters began to find plentiful artillery targets. Whichever guns could fire without inviting immediate response from attack planes made life miserable for the cavalry men. The 5th Cavalry didn’t have far to go to reach the base of Minami proper, where they could find some shelter, but very little heavy equipment made it up with them. I watched as small groups of men dashed over open lava flats to seek cover in small ravines and depressions. Japanese machine guns had been sighted down most long low spots. Squads pulled back out of them under cover of smoke screens. The smoke made things difficult for other units. Smoke works well when pulling back or moving sideways, but it blinds men trying to advance. Eventually they must emerge from the smoke, in an uncertain location, and likely in the sights of enemy rifles. Japanese mortar fire from deep pits was distributed liberally from the mountain down to the shore. Navy fire support could not get down into such positions, and aircraft took risks flying low enough to find them. Attack planes dove against the mountain, playing chicken with the unblinking rock. A few were damaged by ground fire on the way down and didn’t or couldn’t pull up in time. By last light two battalions of the Army regiment were pressed up tight against the base of Minami-dake. They waited for darkness to move casualties back and bring up more equipment. Marines on the west plain had made better progress. They landed through a pair of deserted fishing villages and moved over a mile up hill across a lumpy lava plain. The lava field makes an easy approach to the mountain, mechanically, but it offers little cover from enemy fire. They were exposed, though in the morning the dark side of the mountain dared not fire its larger guns into the lingering night that clung to the western face. By mid morning the Marines had found cover at the base of many bluffs and ridges well inland. They took only ‘ordinary’ casualties for an amphibious assault, but that was better than would be expected for running across a hard surface into the face of a jagged mountain loaded with defenders. By early afternoon progress was halted. Enemy fire made it impossible to move anything across the lava field to the covered positions up front. The entire afternoon on both sides turned into a machine gun duel. Marine and Army positions were then in small arms range of Japanese positions on the mountain. The front lines were still very thin, so to get other teams up they sprayed the anonymous rocks ahead with rifle and machine gun fire. The Japanese who were not forced into cover by all that shot into the open areas that they knew the Americans had to move through. The entire world as can be seen from here is divided up into many unsavory pie slices, each of them the field of fire of a traversing machine gun. The team who can serve up more slices wins.